This weekend, thousands of young prospective lawyers across the nation will receive the results of the July 2015 bar exam. Those who pass will be one step closer to practicing law in their state; those who fail must retreat from society once again, hit the books, and wallow in the depths of misery until the next exam in February. 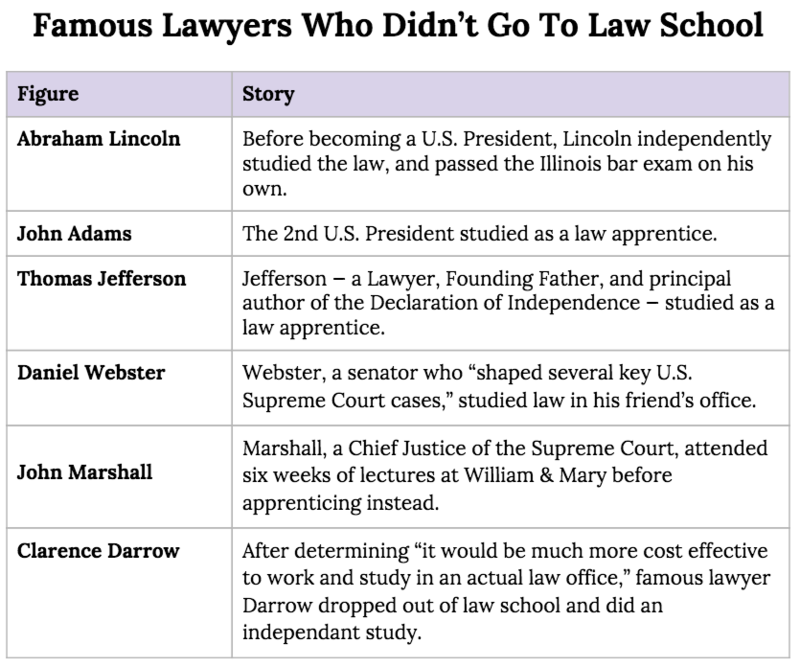 Nearly all those who await results have followed the traditional route to lawyerdom: They’ve toiled through three years of rigorous study at an American Bar Association-approved law school. They’ve taken $5,000+ bar exam prep courses. They’ve spent summers fetching coffee for district attorneys and corporate lawyers. A select few, however, have completely bypassed these steps. Several U.S. states offer a little-known alternative path to the bar exam room: “reading the law” — or serving as an apprentice in the office of a practicing attorney or judge. 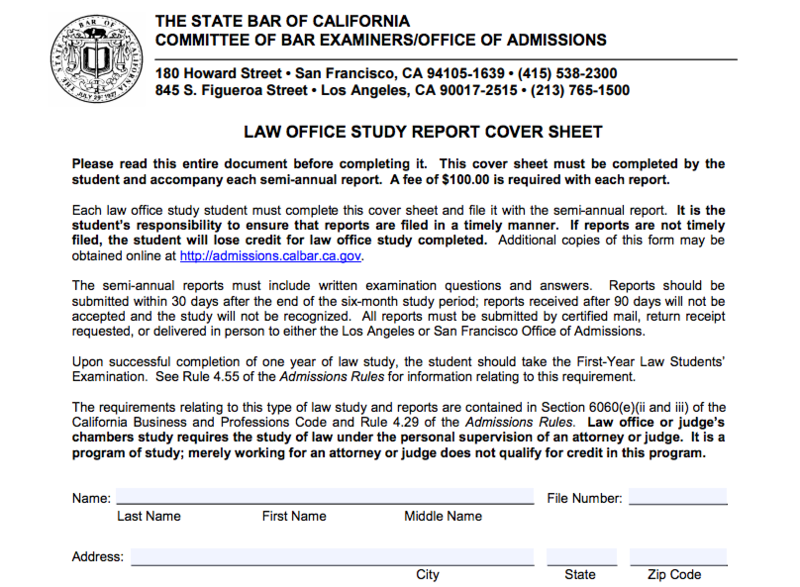 Last year, out of 83,963 bar exam takers, only 60 were apprentices. A mere 17 succeeded in passing the bar exam and becoming eligible to practice law. It is a long, difficult road, requiring four years of mentorship and thousands of hours of self-led work, but when completed, it can save a prospective lawyer hundreds of thousands of dollars in law school debt. So, just how does one go about doing this? Today, going to law school and securing a JD degree is legally required to practice law in most states. But in the expanse of American history, this requirement is relatively new. In the colonial United States, nearly all legal professionals were “imported” from England, where they were trained not through formal education, but an apprenticeship system called the Inns of Court. In this system, those who wished to practice the law had to make a connection with a lawyer (“barrister”), who would provide them with training. “The clerkship program required much individual study. The mentoring lawyer was expected to carefully select materials for study and to guide the clerk in his study of the law to ensure that the material was being absorbed. The student was supposed to compile his notes of his reading of the law into a ‘commonplace book’, which he would endeavor to memorize. 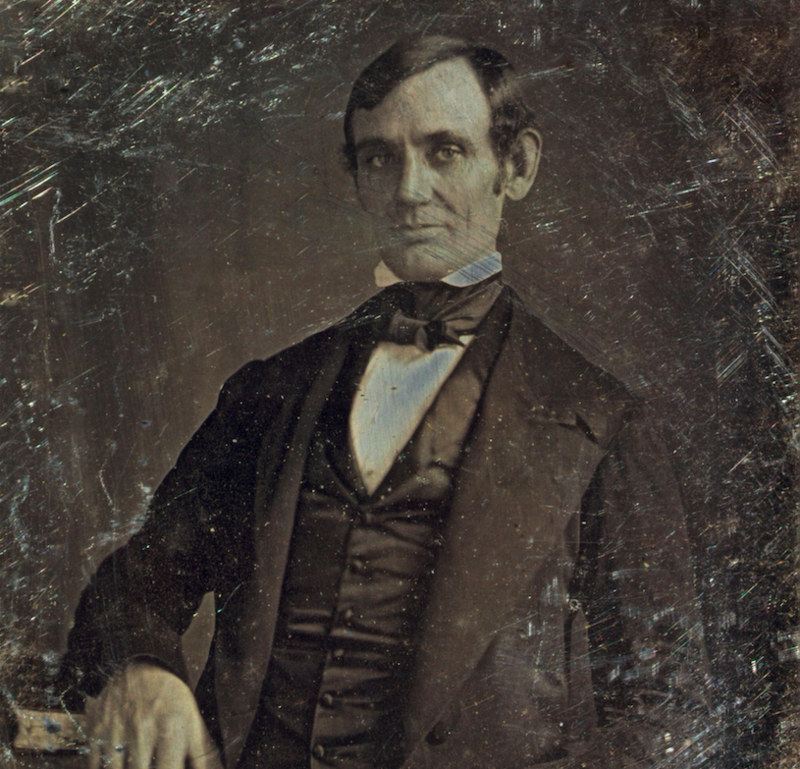 Until the 1870s, a combination of independent study and apprenticeship was the prototypical path of a lawyer. Then, the American Bar Association (ABA) changed everything. Formed in 1878 by a group of 100 lawyers from 21 states, the ABA frowned upon self-led study of the law, calling for a “national, uniform code of ethics.” Throughout the ensuing decades, it lobbied tirelessly, convincing almost every state to only allow law school students to take the bar exam (and ultimately, become lawyers). 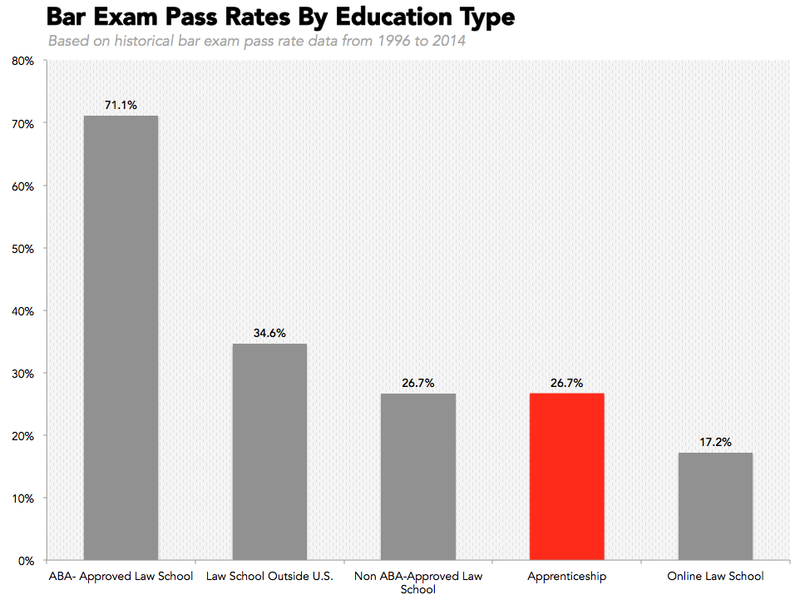 But these numbers represent the results for all test-takers, most of whom are law school graduates. The numbers for those who take the apprenticeship route are much more dismal. 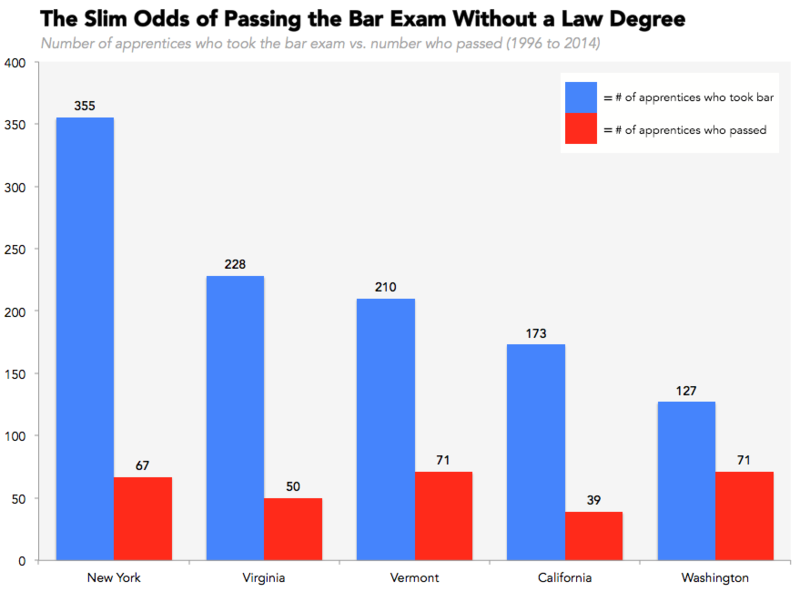 Since 1996, 1,142 apprentices have taken the bar exam; only 305 have passed. Likely, this can be attributed to the nature of an apprenticeship: in a law office study, an apprentice is working under one lawyer, who usually has a specific focus, while law school covers a much wider breadth of topics. Breaking down these passage rates by state does, however, reveal a glimmer of hope. 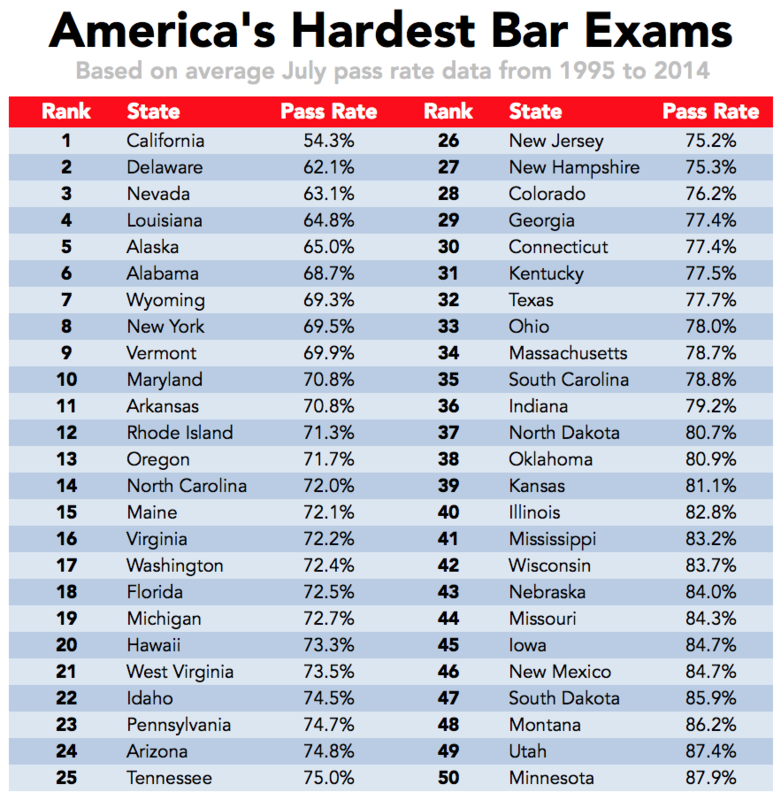 While bar exam pass rates in other states range from 18% to 33%, Washington state has a surprisingly high pass rate, at 56%. Washington’s state bar, more than any other state’s, provides extensive support for students who choose to apprentice, including a volunteer network who sets study standards and monitor progress. Last year, these resources resulted in 67% of Washington apprentices passing the bar exam, nearly as high as those who graduated from ABA-accredited schools. California’s state bar, on the other hand, seems to discourage apprenticeships. She is now about halfway through her four-year apprenticeship with an attorney at the Sustainable Law Economies Center, a local non-profit. Apprenticing in lieu of law school also comes with obvious financial benefits. While most law school graduates wallow in hundreds of thousands of dollars of debt, and have to take “soul-sucking” corporate jobs to recoup losses, apprentices can enter the profession debt-free, and retain the option to take on more humanitarian causes. “There is very little that would entice me to go $100,000 or more into debt for a credential,” one law apprentice jokes. Many of his colleagues share this opinion. 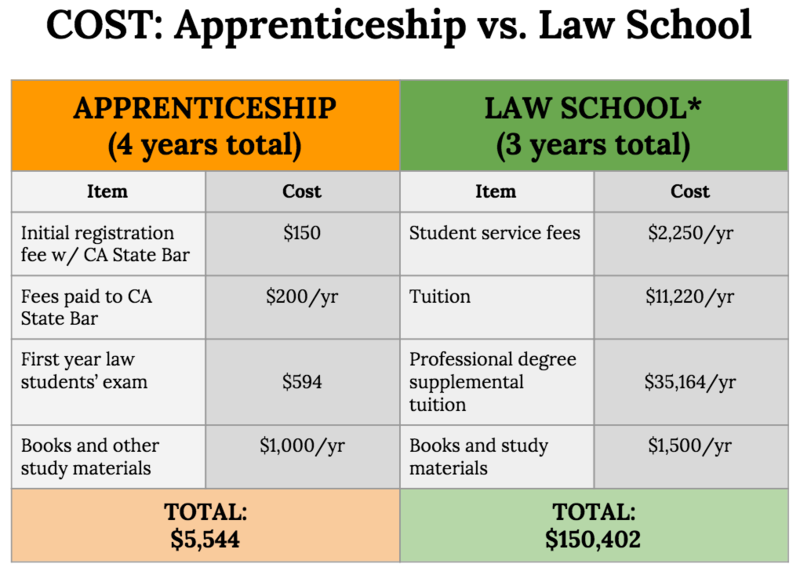 Of course, added to these costs (both for law school students and apprentices) are bar exam test prep courses, which can run anywhere from $1,400 to $15,000, and the cost of the bar exam itself (which ranges by state, from $250 to $860). But even when law apprentices successfully pass the bar exam, and find themselves officially equipped to practice law, they must face the degree-obsessed nature of their industry. Most of America’s prestigious law firms only recruit from top-tier law schools, putting the best positions out of reach for apprentices. After reading law for three years and passing the Virginia bar exam, Ivan Fehrenbach has learned this the hard way. “I have some clients who look up on my wall and say, ‘Where did you go to law school?’ and aren’t too happy with the answer,” he told The New York Times. Today, he is a “country lawyer” who helps clients navigate through things like speeding tickets and divorces. In many respects, the American Bar Association and other overseeing law bodies don’t take apprenticeships seriously, and do everything they can to corral students into three-year, accredited law schools. But despite apprentices’ lower bar exam pass rates and increased hardship in finding employment, perhaps the program should be given more credence. It not only eliminates law student debt, but provides an alternative, more vocational path. Our next post examines how much urine splashes back on you when you use a urinal. To get notified when we post it → join our email list. A version of this article was originally published Nov 15, 2015.